Rajasthan is land of Rajput rulers whose saga of courage, allegiance and love is pride of this state. People of Rajasthan are jolly, colourful and courageous by nature. Its destinations comprises of beautiful forts and palaces, desert camping and wildlife safaris, boating, camel ride along with all this very strong and rich culture is heritage of this state. Great hospitality is another highlight of this state and you will be treated as a prince or princess through out the Rajasthan. Hence the package named as Royal Rajasthan Tour. Welcome to India!!! A warm Namaste from the representative of Plan our Travel's at Airport. Interaction with them and transfer to the hotel. On the arrival at hotel, check-in and relax the evening. As per your interest you can visit nearby one of the Delhi attractions to have enjoyable evening. Back to the hotel and overnight stay. After morning breakfast, dress-up and ready for Delhi Sightseeing. City tour will be guided by our friendly and well-speaking tour guide. Delhi is a metropolitan city and one of the most entertaining destinations to enjoy life to the fullest. City tour can be divides into two sections - OLD DELHI VISIT and NEW DELHI VISIT. Visits the two sides and explore history and cultural heritage. Red Fort is a historical monument located very close to crowded Chandni Chowk Market. The monument was constructed by Shah Jahan in its time. Discover the features of fort. Qutub Minar is a UNESCO World Heritage Site and the tallest ancient minaret in the nation. Explore other ruin structures located in the complex of the Qutub. Relax in its lush green garden and watch the beautiful campus. Lotus Temple is a meditation hall built in unique style and famous all across the world. It is situated very near to Electronics Market – Nehru Place. Other sites include India Gate, Parliament Street and Humayun's Tomb. After city sightseeing, you will take to visit local markets for shopping. Back to the hotel and overnight stay. After morning breakfast, ready for check-out from the hotel. Now, your Best of Rajasthan tour proceeds toward the city of Agra. The journey from Delhi to Agra is quite interesting and you will witness scenic beauty of countryside. En-route you will explore Sikandra which is one of the historical places in north India. On the arrival at Agra, check-in to the hotel. Now, you are going to visit some monuments that tell the bygone era history. Exceptional TAJ MAHAL built elegantly is a prominent monument on the bank of Yamuna River. World knows that it is the monument of eternal love. It was constructed by Shah Jahan. AGRA FORT is another historical fort built by Shah Jahan and served as a capital in its time. The architectural design of the fort is exactly identical with Delhi's Red Fort. Eye-catching places in the city also covered Jama Masjid (place to worship) and Itimad-Ud-Dualah Tomb. Go for shopping in street markets to have pleasurable evening. Back to the hotel and overnight stay. After morning breakfast, check-out from the hotel and drive towards the city of Jaipur. En-route you will visit Fatehpur Sikri. The destination was constructed by the Akbar. On the arrival at Jaipur, check-in to the hotel. Take rest for couple of hours in your comfortable room. In the evening get ready to visit Chowki Dhani which is one of the most popular destinations in the city of Jaipur. The destination is constructed with various themes to promote the rich cultural heritage of the region. Back to the hotel and overnight stay. After morning breakfast, get ready to go for Jaipur Sightseeing. You will roam here and there in the city with well speaking tour guide. 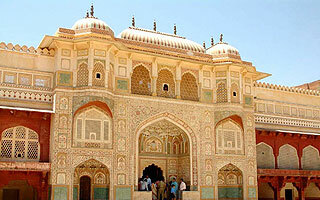 The one and only fort in the region where you can discover the ancient history is Amber Fort. From the fort enjoy the view of Pink City. Hawa Mahal is a perfectly constructed palace in the main road. Visit the palace and discover its elegant colourful rooms. Enjoy snapshot in attractive sites namely City Palace, Jantar Mantar and Albert Hall Museum. Jaipur is also a shopping paradise; make sure to visit its street markets. After morning breakfast, check-out from the hotel of Jaipur and drive towards the beautiful Pushkar city. En-route you will explore some religious Dargarh in the village of Ajmer. And, further journey proceeds to Pushkar. On the arrival at Pushkar, check-in to the hotel and relax. After a few hours be ready to go for Pushkar sightseeing. After morning breakfast, check-out from the hotel of Pushkar and proceeds journey toward Udaipur. On the arrival at Udaipur, check-in to the hotel and relax. You can spend evening in your luxury room comfortably or you can also go for evening walk around the nearby sites. The city of Udaipur is famous for its stunning lakes and also regarded as one of the most romantic destinations in the whole world. Back to the hotel and overnight stay. After morning breakfast, get ready for Udaipur Sightseeing. Udaipur tour will be guided by well-speaking and friendly guide. City Palace – The amazing palace in the city is fascinated by various structures that are quite enough to hypnotize the attention of visitors. Sahelion ki Bari – The famous site is also called as the backyard of Maids of Honour. Jagdish Temple – The temple is the biggest and the most gorgeous place of worship in the city of Udaipur. After morning breakfast, check-out from the hotel and drive towards the city of Jodhpur. On the arrival at Jodhpur, check-in to the hotel. Jodhpur is one of the most attractive and happening cities in the state of Rajasthan. The venue is also referred as the Blue City. After morning breakfast, get ready for Jodhpur sightseeing. You attention will be surely captivated by the destinations to be visited. Mehrangarh Fort is one of the UNESCO World Heritage Sites. Jaswant Thada is an exceptional structural building in the city. Mandore Garden is lush green destination to rejuvenate mind, body and soul. Umaid Bhawan Palace is gorgeous building adorned colourfully. After morning breakfast, check-out from the hotel of Jodhpur and drive towards Jaisalmer. On the arrival at Jaisalmer, check-in to the hotel and relax. The city of Jaislamer is a desrt land and famous all over the world for its various alluring landscapes. The city is also renowned as the Golden City. Travel across the scenic sites of desert through camel Safari. After morning breakfast, get ready for Jaisalmer Sightseeing. Roam around the city with friendly tour guide. Jaisalmer Fort is a UNESCO World Heritage Site and it was constructed in 1156 by Rawal jaisal. The fort gives the appearance of golden colour when the sun strikes. The entire fort was constructed of Yellow Sand Stone. Colourful Patwaon Ki Haweli featured multiple rooms. Every part of the Haveli is adorned elegantly with captivating paintings and sculptures. After morning breakfast, check-out from the hotel and drive towards Bikaner. On the arrival at Bikaner, check-in to the hotel. The city of Bikaner was founded in the year 1488 by famous ruler Rao Bikaji (son of Rao Jodhaji - the founder of Jodhpur). Here constructed incredible forts and palaces which highly signify the cultural heritage. After morning breakfast, check-out from the hotel. You will go for Bikaner Sightseeing. Junagarh Fort - discover the amazing 37 stronghold and 2 entry points of the fort. Lallgarh Palace – it is the most gorgeous palace in the city. It was constructed of Red Sand stone. Bhandeshwar temple – it is one of the sacred places of worship for Hindus in the city. After morning breakfast, check-out from the hotel and get ready for Mandawa sightseeing. The city of Mandawa is famous all over the world for its colourful havelis. A short trip to the beautiful Shekhawati Village will surely magnetize your attention. The havelis located in the region were constructed during the 18th century. Some of the famous havelis are Gulab Rai Ladia Haveli, Goenka Chattri and Jhunjhunwala Haveli. Visit such havelis and discover how royal families spend their luxury lifestyle. After morning breakfast, check-out from the hotel. By our tour representative you will transfer to the Airport. Here your entertaining Rajasthan tour over. Wish you have a lovely moment in the India state.